To sign up, follow the link in the drop-down for each online session below. You can also find monthly schedule releases on our Facebook page. Are you a student or affiliate on a non-member campus, and want to test out a training or workshop? Submit an inquiry to attend your first session for free to faye@postlandfill.org! Member Campus Students & Affiliates = Free! Accessibility Note: If you require accommodation (e.g. deaf or hard of hearing, vision impaired) please email adina@postlandfill.org when you sign up, so we can plan how to make the training suitable and enjoyable for you! This session will guide you in fostering collective leadership for a strong and welcoming team dynamic. We will discuss team roles and task delegation, running effective meetings, and how to pass over leadership to future student organizers. This session will guide you to better understand your campuses’ organizational structure and identify what kinds of resources and support that structure has to offer. Understand where you and your group are situated on campus through stakeholder mapping, power mapping and target mapping and leverage those relationships with an enticing project pitch. This session will equip you the tools you need to activate change on your campus. Effectively manage your projects and initiatives through time-lining and budgeting, while learn how to communicate your message to campus at large via media and in-person engagement tactics. If you complete all three core leadership trainings and at least four specialized trainings, you will become PLAN Leadership Certified! We’ll send you a care package, a digital certificate, and some rad stickers to proclaim your certification to the world. Email adina@postanlandfill.org once you complete all seven! This session will be an opportunity to hear from students who have been successful in their volunteer recruitment and management techniques for move-out programs. Come with questions or best practices to share with your peers! This session will guide you through planning a campaign to Break Free From Plastic on your campus from start to finish! We’ll walk through identifying the goals for your campaign, deliverables and tasks to reach those goals, how to recruit the campus community to back your cause, and ultimately getting the decision makers on campus to approve your project or initiative. Check out our BFFP Pledge & Toolkit to get started! This month’s partner session will be facilitated by our friends at Beyond Retro, a vintage clothing retailer based in the U.K. and Sweden. They’ll speak to the massive amount of waste that results from the fashion industry, and how they are combating that by upcycling discarded garments into new products, and operating as an overall leader in fiber recycling projects! Build a following on campus with social media and fun and effective marketing! This session will cover the basics of how to design and use a logo specific to your program, and tips and tricks to running social media platforms that engage your campus community. We often say that waste is just resources in the wrong place, a logistical problem just waiting to be solved. These sessions will review the ins and outs of the commodities markets that create the demand for responsible management of hard-to-recycle items. Learn how to expand recovery efforts on your campus by establishing collection programs for these hard to recycle items, like electronics, textiles, Styrofoam, carpets and more. Before you can work towards Zero Waste, you need some metrics on campus-generated waste. This session helps you to identify where to find information on campus waste management operations, and how to gather metrics on the types and amounts of waste generated on your campus. We cover volume vs. weight based audits, data analysis, and follow up for making waste management recommendations to your campus. 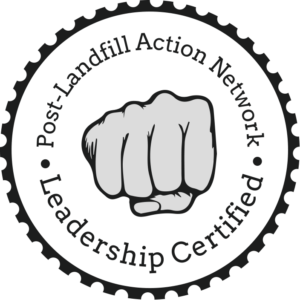 *Book this as an in-person training and we will work with you to conduct a live waste audit on site! Arbitrary expiration dates and unrealistic cosmetic expectations lead to a ton of still-edible food being thrown away! Even before composting your food scraps and other organics, there are a variety of ways to divert food waste from landfills. We will guide you through the waste reduction hierarchy, from food recovery from eateries on your campus, to holding interactive activities around food waste awareness. Move on down the food recovery hierarchy to divert any food waste that is generated on campus to be composted for landscaping, gardening, or agricultural application. Whether you are building a passive garden pile on campus, or hauling to an industrial composting facility, we’ll review best practices for collecting organics, educating for quality control, maintaining a safe and healthy compost system, and incorporating finished compost back into campus operations. Zero Waste events provide an opportunity to educate members of your campus who may not otherwise interact with sustainability initiatives. This session will cover all of the logistics you should consider to make any campus event as close to Zero Waste as possible, including: proper waste station setup, “trash-talker trainings”, coordinating with caterers, vendors, and other event attendees, creative options for reusables, and more! This interactive workshop will help you to understand the intricacies of a campus materials management infrastructure, and how it can be revamped to reach Zero Waste. Learn how to determine which projects to prioritize, how to garner administrative support, and envision a goal of Zero Waste that sets your campus on a realistic timeline with achievable goals. *Book this an in-person training and we will work with you to create a Zero Waste Road Map unique to your campus! Prioritize reuse in your school’s dining program by setting up a campus To-Go Container Program! In this session, we’ll walk you through the process from determining stakeholders and budget, convincing administration and faculty, options for distribution, collection, ensuring student engagement, and more! For more information, check out our To-Go Container Program Guide developed in partnership with Preserve! This session will guide you through zero waste best practices in athletic facilities, from recreations centers and gyms, to fields and stadiums. In addition, we will cover the logistics it takes to make your sporting events and tailgates zero waste. Every year when students move out of their dorms tons of useable stuff is sent to dumpsters. At the start of the following year students and parents buy the same exact stuff brand new. Join us to end this cycle on your campus. This special workshop track is split into Fall, Spring, and Summer sessions, to cover all components of Move-In/Move-Out programs throughout the year. Fall Sessions: Build your program strong by starting early. Whether it is a full blown program, a pilot, or even a proposal, learn to create a project plan, timeline, budget and stakeholders map. Spring Sessions: Discuss next steps for collections logistics, volunteer coordination, spreading the word, taking inventory and preparing for summer and sale. Summer Sessions: Strategize summer sorting, testing, cleaning and pricing of your inventory and set up for a successful Fall sale. Your student group or campaign might be “tabling” on campus for a host of reasons — recruiting new members, gaining petition signatures, spreading awareness about an issue, and more! This session aims to help you do so in the most effective way possible, maximizing your group’s impact on campus. It will be helpful to arrive with a specific upcoming tabling event in mind, but if you don’t have anything on the docket we’ll provide some examples to help get you started! Foster the reuse economy on your campus by establishing a permanent space for exchanging used materials. We will first help you to decide whether a free store or thrift store would better suit the demographics of your campus. Then we jump into all of the logistical components, including: finding a permanent space, layout of your store, financing and budgeting for a reuse space, roles and responsibilities of staff and volunteers, and advertizing your store to the campus community. What are we missing? Submit a suggestion of a skill you’d like to learn, or guest facilitate on a topic that you have expertise in! What topic(s) would you like us to lead a session on? What topic(s) would you like to guest facilitate a session on? What type of event are you interested in organizing? choose from any of our program specific workshop sessions! Bring together campus stakeholders to strategize on zero waste efforts. Campus Tours that show off notable facilities like a composting yard, recycling facility, or student project. We will feature them on our website, social media, and possibly in future PLAN best-practice resources. Examine the origins of the waste crisis by exploring consumer culture, inadequate infrastructure, toxicity and pollution, resource depletion, and environmental injustice. Then, put your knowledge to action by implementing projects on your campus to help solve the global waste crisis! Delve into the logistics necessary to make any campus event as close to Zero Waste as possible, including: proper waste station setup, “trash-talker trainings,” coordinating with caterers; vendors; and other event attendees, creative options for reusables, and more! Framed through the Points of Intervention framework for change, students explore their diversity of options for engaging in meaningful work after graduation. Learn about the problems with single-use plastics and what can be done on your campus and beyond to stem the flow. Examine how the global capitalist economic system helped create and now perpetuates the waste crisis, as well as the role the Zero Waste movement can play in response. Better understand the structural causes of food waste and avenues for reduction. The speaking and event fee that we ask for goes directly into our operations budget, which supports the PLAN team in creating the resources we use to engage audiences at their level. This sliding scale helps to negotiate speaking and events fees which accommodate a variety of circumstances and resources. These prices do not include travel costs. For events outside of the New England or Mid-Atlantic areas, we require a further conversation on support for travel expenses—this can be in the form of reimbursements and/or a couch to sleep on.